Note: this feature is available in Enterprise subscriptions only. If you’ve purchased a ManyCam subscription, you can share it with anyone in just a few clicks. At no extra cost, people you share your Subscription with get all the benefits included in your Subscription plan. They will not get access to any of your files. In case you wish to install ManyCam for yourself on another device, you don’t need to share your ManyCam subscription with yourself. Simply install ManyCam on a new device and sign in to your ManyCam account in the ManyCam app. 1. Sign in to your ManyCam account on our website. Be sure to use the same ManyCam account that you used to purchase your subscription. If the Share button is inactive for you, you may not be the owner of the ManyCam subscription. If you’re using a ManyCam subscription that someone else shared with you, subscription sharing is unavailable for you. Sharing is also unavailable in case you don’t have spare activations left. When you share your subscription with someone, they get an email from ManyCam saying that you’ve shared your ManyCam subscription with them. To activate a ManyCam subscription, one will require their own ManyCam account and ManyCam 5.8 (or higher) for Windows or ManyCam 4.6 (or higher) for Mac installed. If they don’t already have a ManyCam account, they can create one here (it’s free). Please note that accounts are created by users only. The account has to be associated with the email you sent an invitation to. ManyCam is available on our website for free. You can easily download it in one click here even if you don’t have any subscriptions at all. See also How to download and install ManyCam. Before you share with someone: Think about how many activations you want them to have and discuss it with them. 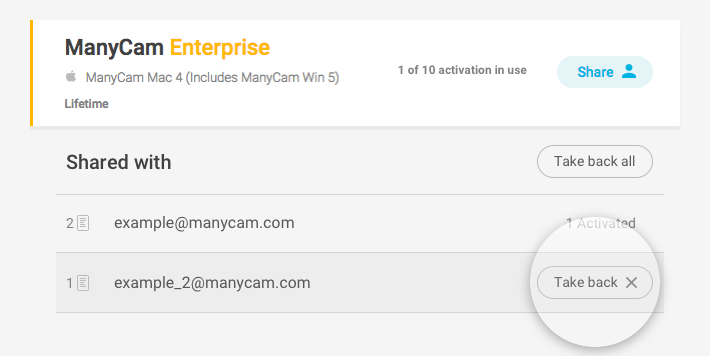 As the owner of the ManyCam subscription, you can take back any activations from your ManyCam account. Before someone installs ManyCam: Make sure that their machine meets the system requirements. On the My Subscriptions page, you can manage all of your shared subscriptions. For example, if you ran out of spare activations or want to start sharing your subscription with other people, you can take back any number of activations you’ve previously shared. When you take back your subscription from someone, they lose all their ManyCam subscription benefits. ManyCam will not be uninstalled from their machine; however, once you take back your activations, it will be deactivated right away leaving the user with a Free version. Click on the Take back button next to the shared activation to take back one activation. You can take back any number of activations you’ve shared.